The Native American Indians hold the spirit of the Buffalo in high regard. This game is based around the West / Midwest American culture with many unique features. The symbols include the 4 different card suites and other images such as Buffalo, Fox, Eagles, Owls, Flowers, Snakes, Lizards, Cactus, and Diamonds. 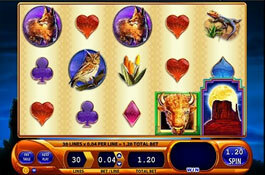 Buffalo Spirit is part of the G+ series which offers excellent graphics, sound, and game play. The game can be played in the 4 game format. The Buffalo Wild substitutes for all other symbols except the Scatter and a second Buffalo Wild has been placed into the game. 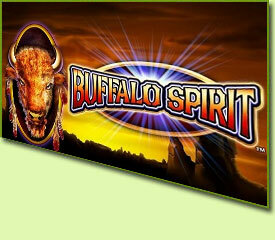 3 or more Moon Scatter Bonus symbols on any active payline trigger the Buffalo Spirit Free Spins. The amount of bonus symbols appearing determines how many Free Spins will be awarded. 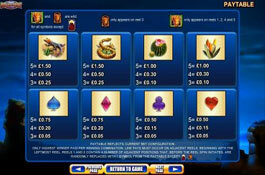 Land all 5 bonus symbols to automatically win 40 free spins! The minimum amount of free spins will be 15 spins. All spins during this feature will be doubled and spins can be re-triggered. 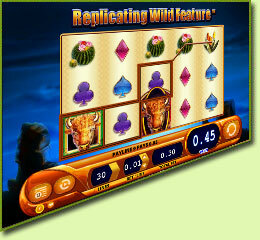 The Replicating Wild Feature can replace a random amount of symbols which is triggered by the Buffalo appearing on Reel 3. Featuring 2 unique Progressive options - Major and Minor Progressive. Win a fortune with just a few spins, plus the chances of winning increase after each spin. 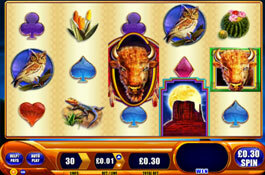 Buffalo Spirit is ideal for both high rollers and casual players, bets range from 0.30 coins up to 150 coins on each spin.